An acrylic-based cove base adhesive for the interior installation of vinyl, rubber and carpet wall base over approved surfaces. This adhesive has excellent initial grab, long term aged bond strength and will not stain light colored base. High performance Acrylic Cove Base Adhesive. Coverages shown are for estimating purposes only, actual job-site coverages may vary according to substrate conditions, trowel conditions and/or application methods. How many cartridges do i need to install 120 feet of the 4'' base? As usual Koffler carries quality products. This item is quality and performed as expected. Definately the way to go. No mess, multi port nozzle makes applying adhesive very easy and fast! easier. you wont find this in big box stores. GREAT PRODUCT..........with the multi bead nozzle it spread easily and the oversized tube for a bigger caulking gun covered many linear feet before needing replacing. It was instantly tacky and when you rolled over the vinyl it spread perfectly. Received the product with the tip pushed to the side, braking the seal to the tube. This made it impossible to use the application tip, had to apply it with putty knife. Hope the packaging includes something to protect the tip next time. Product worked fine after application. We used this adhesive for the Pinnacle Wall Base. It holds really well. Was easy to apply using the 6" spout. Allows about 15 minutes to adjust the base before it starts to dry. Holds very well. Note--We bought the 29 oz cartridge which covered about 30 feet of 5" wall base. 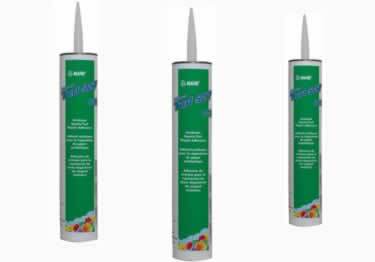 (5 lines of adhesive) Also you will need the large commercial size caulk gun.